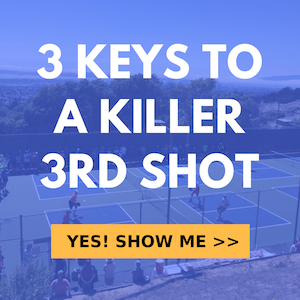 If you have problems returning serves with your backhand side in pickleball and you also want to make it tough for your opponent to hit their 3rd shot, a backhand slice is a good option. There’s a few key components that you need to be sure to execute in order to hit a successful backhand slice and we’ll go over those now. This is specifically a slice from the baseline, a groundstroke hit mid point or a return of serve. You will find that many people will try to serve to your backhand because often that is the weaker side for most players. The information presented here will help you strengthen that side and develop a shot that can help you defend that side while also making it tough on your opponent because the action you put on the ball will be hard to handle. A slice will stay low and skid off the court and create tough third shots for your opponents. The very first thing you want to do is be in a low ready position. You want to be squared up to the opponent that’s hitting the ball. As you see it coming to your backhand you must decide quickly if you will hit a drive or a slice. Once you decide it will be a slice start by turning you shoulders so that your body is perpendicular to the net. As you turn you shoulder, bring your paddle up to approximately ear/head level. Have a slightly open paddle preparation when you take the paddle back. Craddle the paddle and balance it in your non-dominant hand to help you set the paddle well. Once you’re turned and set and you get your back foot planted behind the ball, you’re going to want to step in as you hit the ball and transfer your weight onto the front leg. Be balanced throughout the shot and as your momentum moves forward through the slice remain dynamically balanced. Also, extremely important, is to make sure you get setup early enough and so that you can get behind the ball and are stepping in while keeping the contact point out in front of your body. Contacting out in front cannot be overemphasized. It is critical to get this right all the time. Additionally, be sure to keep your paddle face stable coming into contact, through contact and during follow through. Don’t be wristy. It’s not a cut or a slap despite what many people think they are seeing when they see a full speed slice motion hit by a pro. There is very little wrist involved. The arm and the body are moving out forward from the shoulder, the arm will be relatively straight coming into contact and then finishing forward followed by across the body in a high to low motion and then finishing up again. You create a U Shape with your swing path. Check out the video for Jordan’s live demonstration of a solid backhand slice. Definitely a tool you’re going to want in your arsenal.